Quest 5.1 is now available. Enhanced Game Browser. You can now see star ratings, and read reviews and comments, directly within Quest. You also have more control – from the Options window, you can change the download folder, and enable or disable the Sandpit and Adult categories. Also, the Adult category option can be “locked out” with a registry setting (see “Configuring Quest” on the wiki for details) – handy if you’re rolling out Quest on a school network for example. Simple Mode. Hides Quest’s more advanced functionality in the Editor – great for beginners, or for using Quest with younger children. 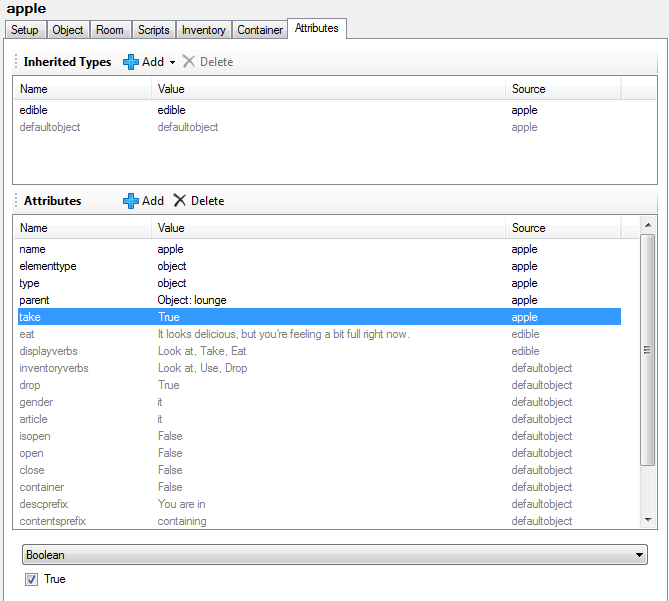 The Editor becomes stripped right down to the basics – only rooms and objects are displayed in the tree, without the distracting “clutter” of functions, walkthroughs and so on. The Script Editor is cut down so only the most important script commands are displayed when adding a command. But full power is only ever a click away – you can toggle Simple Mode on or off at any time from the Tools menu. Walkthrough Enhancements. You can now include walkthroughs in published .quest files, and the new walkthrough assertions feature allows you to create automated tests. See Walkthrough Assertions on the wiki for details. Loops. There is a new “while” loop, and a new step parameter for “for”. Use/Give. These have been moved to their own tab in the object editor, which is now more flexible. There are now separate lists for “Use (other object) on this” and “Use this on (other object)”, so you can set up a “use A on B” relationship from either A or B.
Hyperlinks. You can now customise the look of hyperlink menus – change the menu fonts and colours, and turn link underlining on or off. It’s now easier to create custom hyperlinks – the new ObjectLink function makes it easier to create an object hyperlink, and the new CommandLink function lets you create a hyperlink that will run any command. Metadata. From the game editor, you can now enter a description and choose a category. There is a new game ID which will be used to uniquely identify a game. This will make it possible to upload a game to textadventures.co.uk without having to re-enter descriptions etc. on the web upload form. Better error reporting. Error messages are now more detailed, so if your game won’t load you should have a better idea why. If Quest crashes, you can now submit an error report online. Comments in the Editor. Script comments (lines beginning with “//”) are no longer stripped away when you open an ASLX file in the Editor – comments are now viewable in the Script Editor, and you can add and edit them. You can now turn off sounds from the Options window. Full upgrade notes are available on the wiki. This entry was posted in Quest and tagged releases on January 11, 2012 by textadventurescouk. The first bug-fix release of Quest 5 is now available – download Quest 5.0.1 here. I’m pretty pleased that nothing too major was discovered in the v5.0 release, so thanks once again to the beta testers! New feature: Players can now customise fonts and colours for a game from the new Options window. New feature: Container “open” and “close” messages can be customised per container. Improved: More useful error messages if Quest can’t load a game file due to an error in one of your scripts. Fixed: Various issues with Quest 4 games – locked exits in CAS files, sounds in ZIP files, and timers running at the wrong time. Fixed: Memory leaks in the Editor which could cause Quest to hang when switching to/from the Code View with large games. For the full list, see the Closed Quest 5.0.1 Items on the Issue Tracker. This entry was posted in Quest and tagged releases on October 13, 2011 by textadventurescouk. Quest 5.0 is now available! Download it now. Quest 5 is more than just an upgrade from Quest 4 – it is a completely new system, rewritten from scratch. I started work on it around April 2009, and the first preview version was released in February 2010. In October 2010, I announced that the system was to be free and open source. 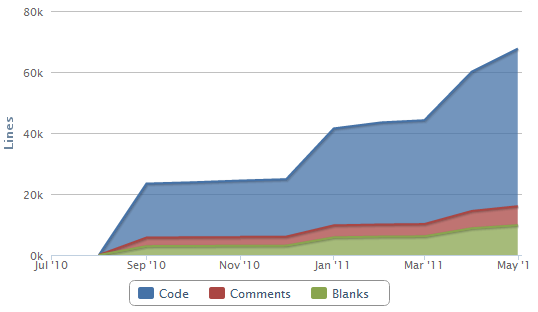 And in April 2011, I decided to increase the pace of development – quitting my job to work on Quest full-time. Compared to Quest 4, the new system is much more powerful, flexible and robust – and I believe it’s even easier to use. The standard game behaviour is written in Quest itself, which means it is completely customisable. New features include support for “undo” when playing games (and also undo/redo in the Editor), expressions, local variables, lists and dictionaries – if you used Quest 4 you’ll want to check out the Upgrade Notes. Easy to create games. It’s easy to get started creating games with Quest 5. The visual editor is designed to be intuitive – everything is shown in plain English, and the aim is that features are easy to find by exploring the menus and tabs. You don’t need to learn programming syntax, or spend time trying to get the system to understand you. I believe that no other system is as easy to get started with. Easy to play games. I would guess that the vast majority of people in the world have never played a text adventure game. Quest is designed so that new players should be able to easily figure out how to play – see my earlier blog post on Eliminating “Guess the Verb”. Powerful. Behind the visual editor is a fully featured programming language. This means that although Quest is easy to learn, it doesn’t restrict what is possible. 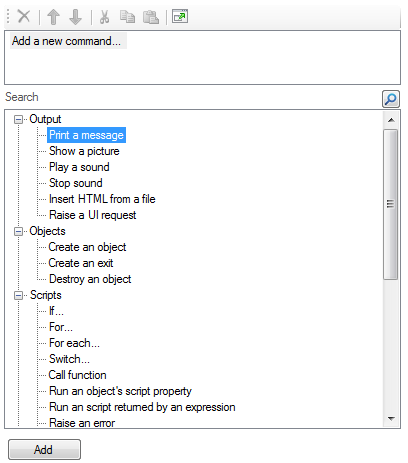 See my earlier blog post about the design of the Script Editor. Shareable. It’s fairly pointless making games if other people don’t play them. Quest makes it easy to download and play games with its integrated game browser – there’s no need to visit a separate site, as you can easily download games directly inside the application. When you create a game and upload it to textadventures.co.uk, other people can play online in their web browser – there is no need for them to download any software, so they can play a game on Windows, Mac and Linux – even iPhone, iPad and Android, though there is still some work to be done to make the site easy to use with those devices. No other system makes it this easy for you to share your creations. Flexible. Quest is fully open source, and under a fairly permissive licence (Ms-PL, which is similar to the MIT licence). This means you can use and adapt Quest for use in closed source applications, to create desktop games or to power websites. No other system lets you do this. International. Quest 5 supports multiple languages. Out of the box, you can create games in English, French, German, Spanish or Dutch. Quest’s standard text comes from one file, meaning it is straightforward to create your own translation. But don’t take my word for it, download it now and see for yourself. There are many more things I want to add to Quest, but “shipping is also a feature” as they say – I thought it was important to get something of release quality “out there” as soon as I could. The Issue Tracker will give you some idea of what is coming up – there are currently a large number of features assigned to a future “Quest 5.1” release, though this is quite a long list at the moment so I would expect a lot of those features to be pushed back to later releases. If you have any other suggestions please let me know! I quit my job to make Quest but I don’t really have a business plan – my primary motivation is really just that I want the software to exist. If it brings opportunities my way, that’s marvellous (and if not, it’s all good for my CV/resumé – I’m not completely nuts). So if you have a particular project in mind, please get in touch. Maybe you’d like me to do some custom development for you? Maybe you’ve seen a feature on the Issue Tracker you would like to sponsor? Or if you would simply like to express your gratitude, if you think this software which I am giving away is worth something, I am of course happy to accept donations too, large or small. If you don’t want to contribute money, there are other ways to show your appreciation – get involved! Quest isn’t just “my” project any more – as it’s open source, I’m happy to accept code contributions and translations. All feedback is very useful, so please report any bugs you find using the Issue Tracker, make suggestions at Uservoice, and join in the forums. You can also email me at alex@axeuk.com or tweet me @alexwarren. Many thanks to everybody who has made suggestions, posted bug reports, contributed features and translations. I don’t even know some of your real names. In no particular order, thanks to Stephen Hart, Jhames, Pertex, Jonathan Dobson, ThePixie, Xordevoreaux, Lina Anna, Guillaume Poulain, and anyone else I’ve forgotten! This entry was posted in Quest and tagged releases on August 30, 2011 by textadventurescouk. Inevitably, a few bugs were logged against last week’s Release Candidate 1, so I’ve now fixed them and uploaded a new Release Candidate 2, which you can download here. The biggest bugs fixed were that the Exits tab wasn’t showing existing exits, and a memory leak that could cause a hang after switching back and forth in the Code View after making edits. See the issue tracker list for full details. The only thing that might remotely be called a new feature is the ability to translate the labels for the panes in the language template. I’ll be up in Edinburgh watching comedy for the next week, which will be nice as London has descended into rioting as I type this – I’m drowning out the sound of distant sirens with some soothing music, so it will be nice to get away from it for a few days (presuming it doesn’t spread to Edinburgh too). If only we could persuade these kids to sit quietly indoors playing text adventures instead. Anyway, I’ll be checking my emails and the forums but may be slower to reply than usual. When I get back I’ll fill in the remaining gaps in the documentation, fix any bugs that have been logged and then we’ll be ready to go! This entry was posted in Quest and tagged releases on August 9, 2011 by textadventurescouk. In the week since Beta 4 was released, 24 issues have been closed on the Issue Tracker, most of which have been relatively minor bugs. I have reached the magic zero mark again, so it’s time for the first release candidate, which you can download now. Being a release candidate means in theory that if no bugs are found, I won’t need to update the setup file for the final release – this could be the one. I do expect there will probably be more bugs logged over the coming week or so though, and I still need to update the documentation, so I’m not saying “this is it!” just yet – I expect that the final release will be available towards the end of August. This entry was posted in Quest and tagged releases on August 4, 2011 by textadventurescouk. Quest 5.0 Beta 4 is out now, and we’re on the home straight – this beta is feature complete. I’m not planning to add any new features to version 5.0 – very minor ones may be still be added, but all the outstanding feature requests have been moved to a planned future version 5.1 release (they may be rescheduled again of course). I will still accept contributions of new/updated translations and minor additions to the Core library – I know a few people may currently be working on these. The project is still hosted on CodePlex but recently switched from SVN to Mercurial hosting, which will make it much easier for people to work on their own forks and for me to manage contributions. you can now refer to objects in the previous command by article or gender, e.g. “it”. So you can type “look at box”, “take it”, “open it” etc. Multiple objects are handled via the usual disambiguation menu – so you can type “put book on shelf”, then “look at it” will let you choose between “book” and “shelf”. You put the book on the shelf. If you don’t like “oops” you can of course still press the up arrow to correct the previous command (or just type more carefully in the first place!). Even though it may not be an especially useful feature, I was pleased that I was able to implement it entirely with changes to the Core library – I think this shows how flexible Quest is, as you could implement your own entirely customised parser in a game if you wanted, and it would work without requiring any software updates. directions can now have default prefixes – there are three different sets, one for compass directions (N/S/E/W/NE/etc. ), one for up/down and one for in/out. These are all blank for English games, but may be useful for other languages. 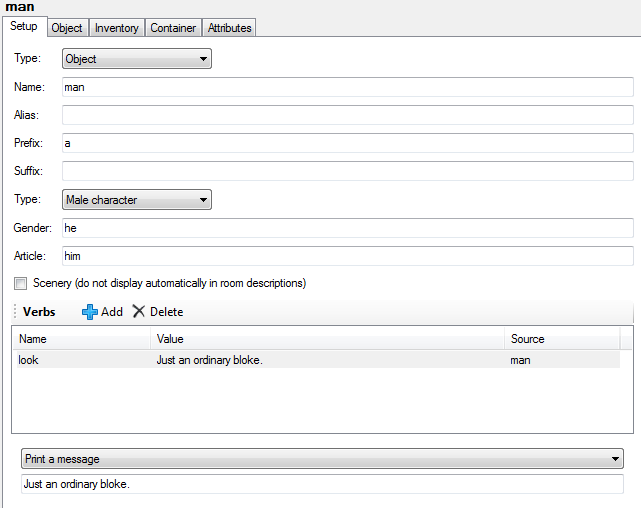 language templates can now add object types, for example for masculine and feminine inanimate objects. "You can't #verb# " + object.article + "." So if you add a verb “smash”, you get sensible default responses “You can’t smash it”, “You can’t smash them” etc. Record a walkthrough while playing the game – on the walkthrough editor, click the “Record” button. Play your game and all steps will be recorded, which is great for testing. If you click “Record” on an existing walkthrough, it will play through and you can then append more steps. Add external links to a game, so you can link back to your own website or email address. There is a new “in” direction (which has meant a slight redesign of the compass rose). You can now run scripts after taking, dropping, opening, closing, locking, unlocking, switching on, switching off an object, so you don’t need to override any built-in behaviour if you just want to play a sound, show a picture, release a herd of wildebeest or whatever in response to the player doing one of these “standard” things to an object. Finally fixed a long-standing design flaw with verbs in Quest, in that it was easy to override and therefore break default functionality. I’ve lost count of the number of times people have asked for help because the “take” command had suddenly stopped working, and it was because they had added “take” as a custom verb instead of using the Inventory tab. The editor now prevents you from adding a verb to an object that would clash with an existing command, and gives you guidance on where you should go to put that script or message instead. Get those bug reports in! The next release will be a Release Candidate, probably in a couple of weeks. All being well, we should go “gold”/RTM around late August. In the meantime I need to complete the documentation, one of my least favourite tasks! This entry was posted in Quest and tagged releases on July 28, 2011 by textadventurescouk. Quest 5.0 Beta 3 is now available for download. The first draft of the Quest 5.0 Tutorial is also now available. We are getting closer to the final 5.0 release now. The Issue Tracker currently only has a few relatively minor features assigned to a future Beta 4 release, so what we have now is close to the final version 5.0. Of course, version 5.0 is just the beginning – a rebirth for Quest, really – and I have lots of ideas for the versions that will come afterwards. But I think it is important now to get the new system stable and “out there”, so I don’t expect that there will be too many dramatic changes before the “gold” or “RTM” version 5.0. Status Attributes – these are the equivalent of Status Variables in Quest 4, and let you display attributes (such as player health, money) in the pane on the right of the screen. 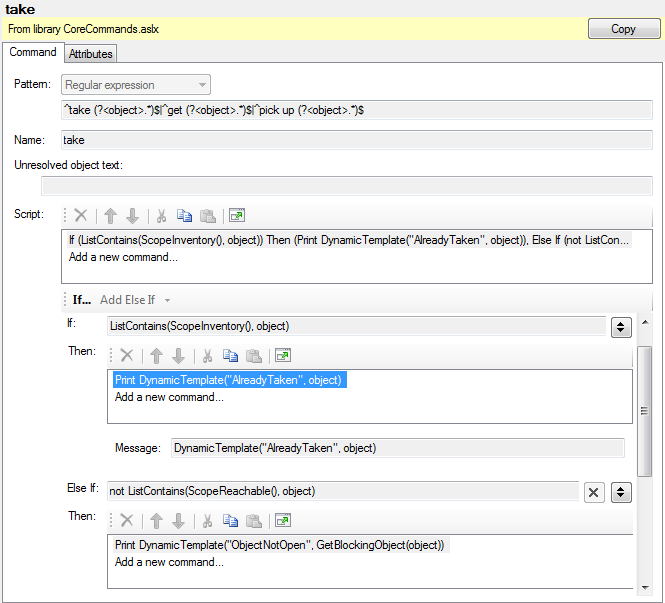 Multi-object commands – “take all” and “drop all” are now implemented by the Core library. Ask/Tell – you can now give characters a list of subjects that the player can ask or tell them about. Compass exit editor – more easily create exits between rooms, including automatically creating exits in the other direction. Hyperlinks in the exit editor allow you to navigate between rooms. Play YouTube and Vimeo videos – now built-in to the Core library. Switchable objects – easily implement objects which can be switched on and off. Object Types can now extend string lists – this is used so that multiple types can contribute to the display verbs list. For example, if an object is both a container and switchable, the display verbs list shown when the player clicks its hyperlink will include “open”, “close” as well as “switch on”, “switch off”. Player object is now shown in the editor – easier to set the start location, set up attributes, and set up the player’s initial inventory. Editor now watches file for external changes – so you can more easily make edits using an external text editor while the file is still open in Quest. This release also fixes all bugs which have been logged so far – 45 items since Beta 2, according to the Issue Tracker. Many thanks to everybody who has been logging bugs so far. Please keep them coming! This entry was posted in Quest and tagged releases on July 17, 2011 by textadventurescouk. It’s been another busy month of Quest development, and I’ve just released Beta 2. The main change in this release is a substantial redevelopment of the Editor UI – it is now written in WPF, which has made laying out dynamically sized controls much easier. In particular, this is what has enabled me to implement the new-look Script Editor, as described in last week’s blog post. You can now keep a picture at the top of the screen, while the text scrolls beneath. This has been a common request for years, and I’m glad to have finally implemented it. Using HTML means that you can use any picture size you like, and the frame will resize accordingly. It means that it works the same wherever your game is being played – whether in the Quest desktop software, or online via the WebPlayer. It also means that in upcoming versions I’ll be able to extend this functionality to enable things like using a YouTube clip in the static frame instead. Timers are now implemented, and you can use them in a couple of different ways. First, you can use them in the same way as in earlier Quest versions, where you can run a script at specified intervals. But there’s a new simpler way of creating a “one off” timer, which will run one time only, after a certain time period has elapsed. This creates a timer object behind the scenes, so even if the player saves the game and reloads it later, the timer will still be triggered at the correct time. Turn Scripts are analogous to timers, but instead of running a script at specified time intervals, you can run a script every time the player enters a command. You can create multiple turn scripts in the game or in different rooms, and enable/disable them at will, so it’s a bit more flexible than the “afterturn” scripts from previous Quest versions. Also, just as you can now run a script after X seconds have elapsed, you can now run a script after X turns. When adding an “if” script, you can choose “random chance” from the dropdown. You can then enter a percentage between 0 and 100, and that script will then have X% chance of running. In Beta 1 you could save your game as an ASLX file, but there was no safe way to distribute your game. Beta 2 comes to the rescue with a new “.QUEST” file format, which is similar to the CAS format in previous versions. It will take your game, including all libraries and external sound, picture files etc., and output one .QUEST file. This will be the file format you’ll have to use to upload your game to textadventures.co.uk. This will ensure that games written for one version of Quest will still work in future versions, as the entire Core library will be included within the .QUEST file, so there won’t be any incompatibility problems as features are added and changed in the Core library. You can now put what the player types next into a string variable, ask the player a “yes or no” question, and there’s a full-screen option if you want to go completely old-school and get your Windows taskbar out of the way. You can download Beta 2 now from the Quest 5.0 Downloads page. You can subscribe to the Quest announcements mailing list, and get updates on Twitter via @TextAdv and @alexwarren. If you have any questions or problems, please ask in the Quest 5 Forum or check the Quest 5 documentation wiki. Please report any bugs on the forum or the Issue Tracker, or email me at alex@axeuk.com. This entry was posted in Quest and tagged releases on June 20, 2011 by textadventurescouk. Quest 5.0 has finally reached beta stage! This is the first “full-featured” release, in the sense that it’s the first release of Quest 5.0 which you could use to create a game from scratch. It will be quite buggy though, as all Beta releases generally are. Also, although it’s version 5.0, don’t forget that as this is a complete rewrite, it’s a fundamentally brand new system, so this is more like a v1.0 beta. But if you like Beta software, that’s a good thing, because there will be even more bugs for you to find! You can report bugs on the forum or the Issue Tracker or you can email me at alex@axeuk.com. I left my job a couple of months ago to work full time on Quest. There’s just so much that I want to do, and it would take forever to get there otherwise, so I’m taking a short-term hit to invest in the long-term future of Quest (I haven’t quite worked out how to make any money from a free open-source system, so this may not necessarily be a clever idea). I’ve been working hard to get to the point where Quest 5.0 is now of “initial beta” quality. There are still quite a lot of outstanding tasks, but it’s now at least possible to load Quest, create a new game from scratch, add things to it and play it. The foundations for all features are at last in place, and we have a solid base from which to build. So, what’s new since the last technical preview? Quest now features an integrated download manager. 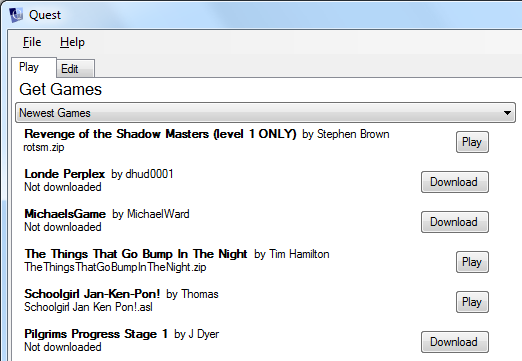 You don’t need to go to a website, download a game, find it on your hard disk and then open it – instead, as soon as you open Quest, it will grab a list of games from textadventures.co.uk, which you can download within the program and play immediately. The Editor has been the main thing I’ve worked on over the last few weeks. You can now create a new game from scratch, add rooms, objects, exits, verbs, commands, functions and walkthroughs, and then play your created game – all within one application. 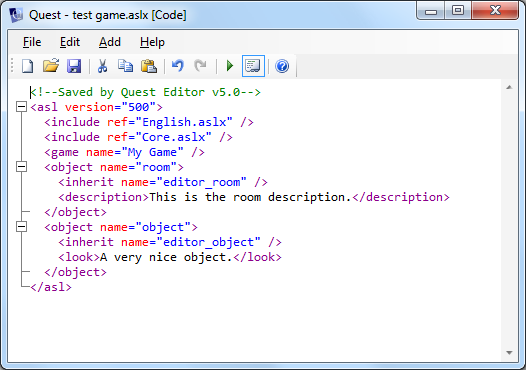 Every kind of thing in Quest is an element – an object, a verb, an exit, a function… they’re all elements, and they’re all displayed in the tree on the left hand side of the Editor window. It will be familiar to Quest 4 users, but it’s even better in Quest 5 – if you have objects inside objects inside other objects, you can see the full hierarchical relationship within the tree, and you can click and drag to move elements around. It also has a search feature. The Script Editor is probably the most important part of the Editor, and the most complex. Behind Quest 5 lies a much more powerful version of the ASL scripting language than was present in previous versions, yet I want the Script Editor to be even easier to use. The general aim is to make it possible for you to edit complex scripts, just a complex as in any “full” programming language, but in plain English. Quest takes a slightly different approach compared to other systems such as Inform. In Inform, the syntax is very “English-like”, making it easy to read Inform code, but you have to know the “correct” way to express yourself as you type in code. In Quest, you don’t type commands – instead, you select them from a searchable, categorised list, and you fill in the blanks. Step 3. Lather, rinse, repeat if desired. You can add as many script lines as you like, and you can build up arbitrarily complex scripts if you add something like an “if” command or a loop. I think the current design is far more user-friendly than the Script Editor in Quest 4. There are no pop-up windows, and you can’t accidentally change the command you’re editing into a completely different command with a misplaced mouse click. The list of scripts updates in real-time as you type, even as you update nested scripts (such as “Print a message” commands inside an “if” script’s “then” block). There’s still some way to go with the Script Editor, though. A major part of the complexity of a script is in creating expressions – calling functions etc. The current beta doesn’t give you any help with that. Eventually I want there to be drop-down lists of functions, but for now you’ll have to type in expressions yourself. Also, the Script Editor is currently implemented in WinForms, which seems to be quite glitchy when you have a complex script containing multiple “if” commands as it’s creating quite a lot of window elements. 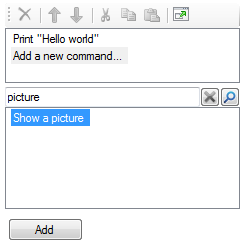 I’ll probably work on a WPF version of the Script Editor for Beta 2. The Editor supports unlimited undo and redo. Didn’t mean to delete that object? Pasted a script in the wrong place? Now you can go back in time to correct your misdeeds – your text adventure editing ones anyway. You can cut, copy and paste any element. In QDK 4 you were limited to objects – now you can copy and paste everything. As both the Player and the Editor are the same program, when you click Run you’ll be able to play your game in the same window. Typing “quit”, pressing Ctrl+F4 or choosing “Stop Game” from the File menu brings you back to the Editor. QDK 4 had an ASL viewer which wasn’t too useful – now you can quickly drop into the code viewer and edit by hand. Useful for those comfortable getting their hands dirty with code. You get XML syntax highlighting too. Most of the standard game functionality comes from the Core library, and the Core library consists of elements, so it makes sense to be able to view these in the editor too. If you turn on “Show Library Elements” from the Filter menu at the bottom of the tree, you can see all elements defined in the library. If you select one of these, you can see its entire definition, and copy it to your game if you want to customise it yourself. The “Attributes” tab on elements allows you to enter your own arbitrary attributes. All element data is stored in attributes, so you can in fact edit every aspect of an element here. If an attribute is greyed out, it’s because it’s inherited from a type instead of being defined on the element itself. You can still edit them though – they’ll be copied to your element if you do so, which will mean you’re overriding the default value from the type. I’ve designed Quest 5 from the beginning to support games in other languages. No game text is hard-coded – it all comes from a library. When you create a new game in the Editor, you’ll be prompted to choose a template, and already in Beta 1 you can choose from English, German or Dutch templates. Many thanks to Lina Anna and Pertex respectively for providing the Dutch and German translations – I’m very keen for Quest to support as many languages as possible, so I’d be happy to receive any other translations! You can edit a copy of the English.aslx file in your Program FilesAxe SoftwareQuest folder. Beta 1 is just the beginning – there’s plenty of work to do. I already have a fairly extensive list of things to implement for Beta 2 – see the Beta 2 items on the Issue Tracker for full details. I’m hoping to be able to iterate through releases fairly quickly, so hopefully it won’t be too many weeks before Beta 2 becomes available. I almost have too many ideas for Quest, so it’s important to avoid “scope creep”. Version 5.0 will be good, but I don’t want it to be like Duke Nukem Forever – so I’m planning to release the final version within a few months, with more goodies to come in versions 5.1, 5.2, 6.0 etc. You can download Beta 1 from http://quest5.net/index.php?title=Downloads – it will give you an update notification on the game browser screen when a new version is available. You can also subscribe to the Quest announcements mailing list here. You can also get updates on Twitter via @TextAdv (for Quest and textadventures.co.uk announcements) or by following me at @alexwarren (there are some Quest announcements, but it’s mostly other rambling and ranting). This entry was posted in Quest and tagged releases on May 24, 2011 by textadventurescouk. Quest 4.1.5 is now available. Loading QSG (save game) files is now faster. Fixed a QDK bug with the “create corresponding exit” checkbox, which would become re-checked if it was turned off. This entry was posted in Quest and tagged releases on May 10, 2011 by textadventurescouk.